Engelmann spruce has a large range that stretches from British Columbia, Canada through the western US to New Mexico and Arizona. This species is primarily found at high elevations in areas associated with heavy snowfall. It is very sensitive to high temperatures particularly as a seeding where soil surface temperatures above 45 degrees Centigrade can begin to cause seedling mortality. Prefers cool, humid environments. In the Pacific Northwest Engelmann spruce is primarily found as a minor component of the high elevation forests along the east slope of the Cascades. Engelmann spruce prefers cool, humid environments characterized by long winters and short, cool summers. It can grow in a wide range of well drained soils provided that there is access to adequate moisture. Generally a long lasting seral species, Engelmann spruce can be found as co-climax components of Subalpine fir/Engelmann spruce stands. Pure stands of Engelmann spruce can also be found, particularly in cold environments. It is also relatively shade tolerant compared to the tree species it is associated with, except true firs and hemlocks. 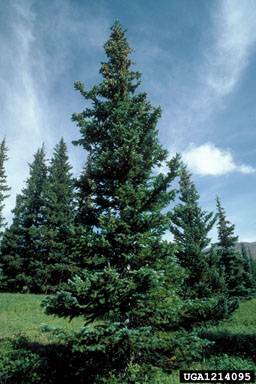 In the Rocky Mountains Engelmann spruce is primarily found associated with Subalpine fir or in pure stands near treeline. It can also be a minor component in other forest types. In the PNW it can be found growing, primarily in frost pockets, in association with western white pine (Pinus monticola), Douglas-fir, western larch (Larix occidentalis), grand fir (Abies grandis), and lodgepole pine (Pinus contorta); Pacific silver fir (Abies amabilis), mountain hemlock (Tsuga mertensiana), alpine larch (Larix lyallii), and whitebark pine (Pinus albicaulis). Seeds can be collected once cones mature. Typically seeds are released when cones begin opening in September, though some seed will remain in cones through the winter. Cones can be collected before seeds are fully mature as seeds will continue to ripen. Seeds can be separated by first drying the cones then tumbling or shaking. Seed wings can be removed by placing in a cotton bag and rubbing by hand. Seeds should be soaked in water for 24 hours then chilled for 6 to 8 weeks at 2 degrees C.
Engelmann spruce seeds can be stored for 10 to 20 years. Seeds of Engelmann spruce can safely be stored in cones under field conditions for up to 5 months. For longer storage, seeds should be cleaned and dried to 4-8 % moisture content. Seeds can then be placed in airtight containers and stored between -10 and 3 degrees C.
Soil or medium requirements Engelmann spruce seeds will establish on a variety of substrates. Germination is slightly higher on mineral soil or a mix of humus and mineral soil. The main medium requirement is adequate moisture. Seeds or seedlings are commonly used in propagation. Studies in Colorado have shown that seeds sown in the field have up to a 28% survival rate. Seedlings improve the success rate but are more costly. Between 300 and 700 seedlings should be planted per acre. Once established, seedlings are sensitive to high temperatures and drought. If possible seedlings should be grown in partial shade and given at least 1 inch of precipitation spread over each month during the dry season. Engelmann spruce has adopted a slow growth strategy in response to the harsh environments where it is found. Trees may be only 4 to 5 ft tall after 20 years. However, the species is relatively long lived and individuals 500 to 600 years old are not rare. 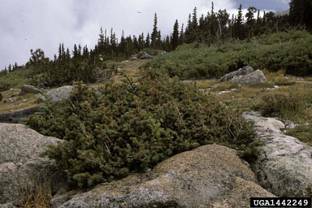 The tree can spread by layering of the lower branches, particularly at high elevations where conditions promote a prostrate growth form.